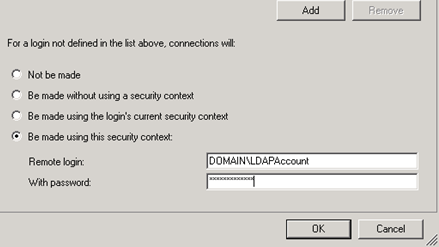 Configure Security so connections will be made using the security context: Enter an LDAP lookup service accounts credentials. 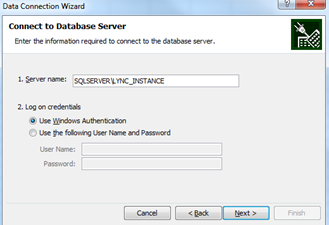 Create a new database named LyncBilling on the same instance as your Lync LcsCDR database. 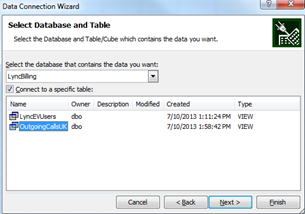 You should now have two views created in the LyncBilling database. 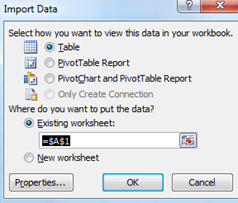 Click OK on the Import Data window. 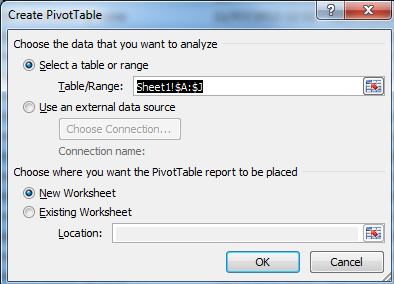 Click in the top left corner of the Data sheet to highlight all cells. 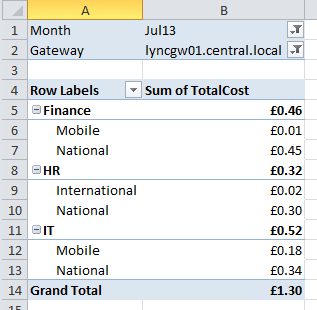 You can now use the Pivot Table filters to find out call costs for Departments based on a particular Gateway and Month. This entry was posted in Lync / Skype4B and tagged Lync 2013, Microsoft Lync by Chris Hayward. Bookmark the permalink. I hope you can help me. I was trying your tutorial but I stopped at the LyncEVUsers view because I don’t get my server right. Can you give me another example or can you tell me where I get the information of my server? 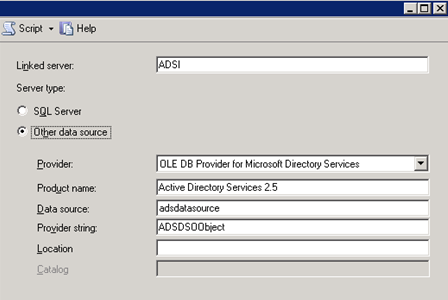 In the LyncEVUsers view you need to change LDAP://DC=domain,DC=local to your Active Directory LDAP distinguished name. after I changed the code into “LDAP://DC=Contoso,DC=com” I got a SQL Execution Error. An error occurred while preparing the query “SELECT displayName, msRTCSIP-PrimaryUserAddress, department FROM ‘LDAP://DC=Contoso,DC=com’ WHERE objectClass = ‘User’ AND msRTCSIP-OptionFlags = 385” for execution against OLE DB provider “ADsDSOObject” for linked server “ADSI”. Sorry I’m not sure. Maybe check the SQL Linked Server. Was the connection test successful? Thanks for this tutorial, it really helped! 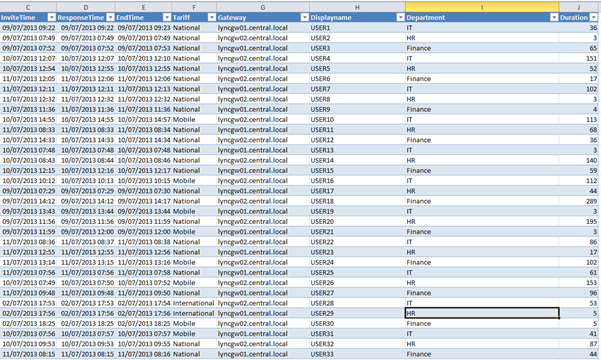 I have written a basic solution to Lync Call Accounting which I hope will become a report server report in time. The solution can figure out who should be billed for the call, then looks up that users name, department and company up in Active Directory – http://www.lync.geek.nz/2014/03/lync-call-accounting-for-user-or.html. Please leave feedback so I can improve it. This is great Chris. I’m trying to customize “OutgoingCallsUK” code to fit US dialing Local and international. Any help will be appreciated. You will need to modify the CASE section of the SQL. I haven’t worked with US numbering but I can see that +1 is the international code for the whole of North America which makes it slightly more tricky. This is where it gets tricky with the USA as +1 is used in other countries. Hope that helps. Hi Chris, I was wondering If I could have permission to use one of your images in a small training video I am doing. You can reach me at cward23@gmail.com Cheers! 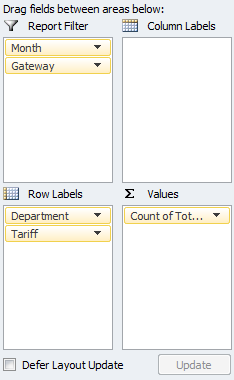 is it possible from your query to filter the current month data only. Sesssiondetailsview will have how many months data.